Home Residents How do I… …Drain my Pool or Spa Water? 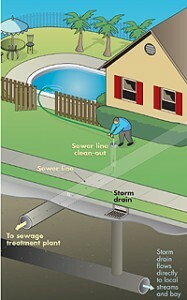 Keep pool, spa and fountain water out of storm drains, creeks and the Bay. When you need to drain your pool or spa, dispose of the water through your sanitary-sewer clean out and rinse your filter over landscaping. Please see the brochure for further instructions. Storm drains flow directly into our creeks and the Bay. A properly maintained pool, spa and fountain will reduce the need for draining. CLICK HERE for more information and downloadable brochure.